I teamed up with Artisan’s Asylum to facilitate creative coding workshops for adults. The April Drawing with Code workshop was a blast! The students were excited to use code and technology to conceptualize their artistic visions. Students worked hard on creating an array of projects, ranging from 2D geometric stills to dynamic, interactive animations such as these beautiful works created by the students in the April workshop. It was very exciting for me to introduce adult novice coders to creative coding. 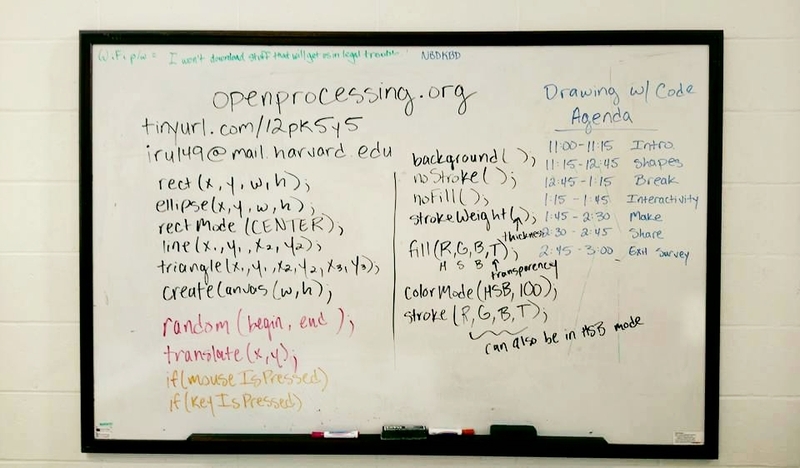 I work with a lot of kids, and have seen them fall in love with programming while exploring how coding can be used to create artwork. I was determined to make coding more approachable for novice adult coders and creatives with limited tech experience. I wanted them to enjoy coding and see it as the creative endeavor that it is, in the way that my younger students had come to do. While everyone was new to programming, the group largely consisted of graphic artists, UX designers and art educators. By working with this group, I learned that creative coding courses can have huge benefits on graphic and UX designers trying to understand the mechanics behind how digital visuals are created and art educators looking to introduce more technology into their work. For future workshops, I’m hoping to individualize the content to more directly meet the needs of participants. For example, I’m looking forward to incorporating lesson ideas for educators, as well as integrate solutions for issues that graphic artists deal with in their daily work. That may include topics such as navigating the coordinate system that digital visuals are produced in or how to use code to produce visuals with text and how to program various text fonts. Moreover, I’m excited to continue sharing coding with a broader audience and how it can be used in a range of fields, especially creative fields. ©2016 blendedworld.co — All Rights Reserved.